Admittedly, this entire gift idea centers around a recipe from Nigellissima by Nigella Lawson for something called Spaghetti Spice. 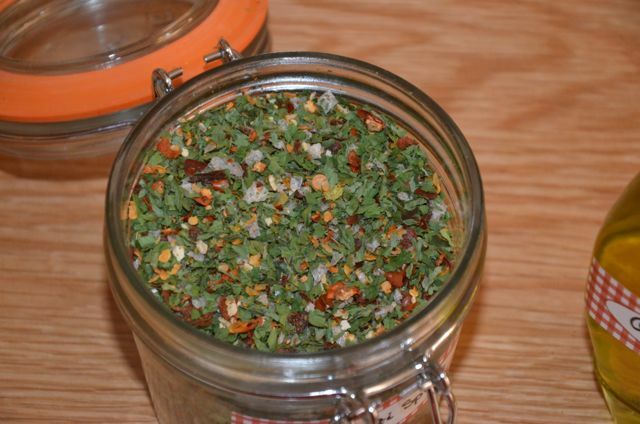 It's a simple mix of dried herbs, spices & salt that when mixed with a bit of pasta cooking water and some olive oil, makes a delicious coating or sauce for pasta. Click here for the recipe, or better yet, grab yourself a copy of Nigellissima - it's by far one of my all-time favorite cookbooks and I use it so often that the pages are stained with splatters of oil from sitting it by the stove. Using this simple recipe, putting the rest of this gift together is so simple that anyone can do it. 1. Using the pen or marker, write out the instructions for how to use the Spaghetti Spice (available in the recipe). Roll up the paper and tie it with a ribbon or put it into a small envelope and label it instructions with one of the labels you'll use on the jars. 2. 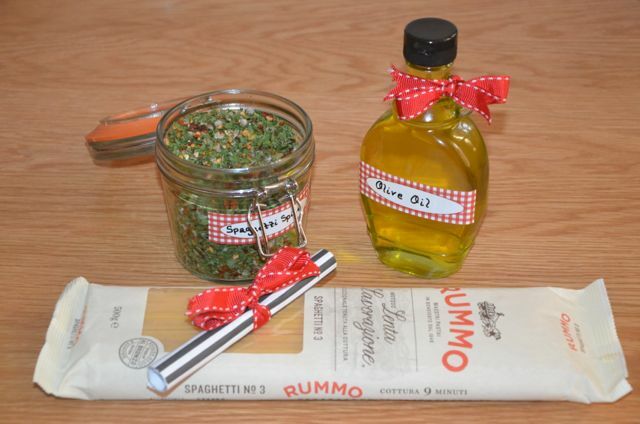 Fill the bottle with olive oil and the jar you're using with the Spaghetti Spice mixture. Wipe them on the outside to make sure they're clean with no drips or spills. 3. 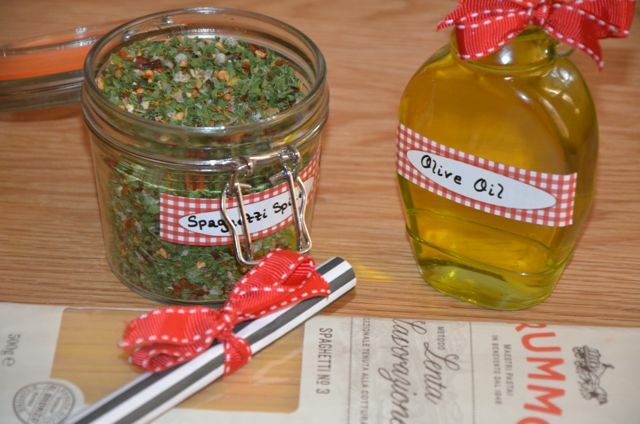 Place a label on both the olive oil bottle and jar of Spaghetti Spice and write on them accordingly. 4. Decorate any of the jars or bottles you like with a ribbon bow. Feel free to get creative and use anything you like such as raffia, yarn or whatever you have on hand. 5. Package it all together with the pasta and it's all set and don't forget to include the instructions. What homemade gifts do you enjoy giving to friends and family?